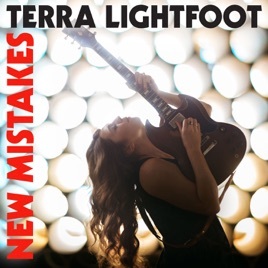 Come for Terra Lightfoot's crunchy blues guitars, stay for her true instrument: her voice. Like drinking a fine red wine, taking a moment to savor Lightfoot's full-bodied voice will reveal depths that truly bring out these blues rock songs. To be sure, Lightfoot's a badass guitar player, evoking an AC/DC road trip through the delta. While the first half of the album is mostly uptempo, Lightfoot stretches her songwriting muscles with "Norma Gale," and this is where the album takes its strongest directions. Following in the grand tradition of Canadian folk singers who capture big sky feelings with intimate songs, Lightfoot cuts to the core amidst a big production. The song is a biography of real almost-famous Canadian country singer Normal Gale, who sadly didn't live hear the final cut of this song. "Two Hearts" playfully subverts girl band tropes, turning a dead-end dating scenario into a sweet, nostalgia-fueled ride. On the surface, New Mistakes is a bar band rocker, but if you dig a little there's a big payoff. Thanks for reading! If you're able to, please help keep the blog afloat financially by making a one-time contribution on my Ko-fi cup or subscribing for $1+ a month on Patreon!